Two new Iranian movies, both generating buzz at Sundance, provide a glimpse into the country rivaled only by the protesters on TV. At this year’s Sundance Film Festival, two Persian-language films—both by female filmmakers—once again demonstrated why Iran’s vibrant film industry remains among the most celebrated in the world. And Women Without Men—a feature film by Iranian director Shirin Neshat which opens on Friday—also adds to the canon. Kick in Iran, a documentary by Fatima Abdollahyan, follows the triumphs and travails of 20-year-old tae kwon do champion Sara Khoshjamal, the first Iranian woman to qualify for the Olympics, as she competes for a medal in Beijing. Kick is a sobering documentary, representing the very real struggle of Iranian women to succeed in a society dominated by men. Years before our television screens were flooded with images of green-clad protesters, the only access that most Westerners had to Iran’s dynamic culture came from movies. The second Persian-language entry, Women Without Men, is the feature film debut by Shirin Neshat, arguably one of the most celebrated visual artists of the last decade. (Neshat has already won the Best Director Award at the Venice Film Festival.) Set in the backdrop of the CIA coup that toppled Iran’s first democratically elected government in 1953, the film elegantly interweaves the lives of five women as they struggle to cope with the dramatic political and social forces shaping the world around them. Iranian films have long had a presence at Sundance, often playing to packed houses and taking home major awards. According to John Nein, senior programmer at the Sundance Film Festival, there were half a dozen Persian-language films to choose from this year. Indeed, years before our television and computer screens were flooded with riveting images of green-clad protesters—many of them women—fearlessly facing down Iran’s brutal security forces, the only access that most Westerners had to the country’s dynamic social, religious, and political culture came from the hypnotic images captured by Iran’s filmmakers, widely viewed as the most accomplished in the developing world. Iran’s artists, writers, and filmmakers have been considered a troubling voice of dissent long before the 1979 revolution and the subsequent founding of the Islamic republic. This was especially the case in the turbulent decades of the 1960s and '70s, the era that launched what is commonly called the Iranian New Wave, a cinematic movement that gave birth to the careers of some of the country’s most acclaimed contemporary filmmakers. Heavily influenced both by the French New Wave and by Italian Neo-Realism, these films took as their subjects the repressive political atmosphere that existed under the rule of Iran’s long-serving dictator, or shah, Muhammad Reza Pahlavi. The shah, though reportedly a fan of American films, dealt harshly with these filmmakers, throwing them into prison and banning and censoring their films. But if life was difficult for Iran’s filmmakers under the shah, it has become almost intolerable under the Islamic republic. Since 1979, Iran’s censorship laws have become both more severe and more haphazardly applied. In fact, the laws are now so baffling and inconsistent that they make Hollywood’s opaque MPAA rating system seem downright transparent. So, for instance, The Lizard, an uproarious comedy of errors about a petty criminal who poses as a mullah, originally passed all government censors and was allowed to screen throughout the country. But after breaking all box-office records in Iran, the movie was immediately and inexplicably pulled from screens by the same censorship office that passed it in the first place. The irony is that part of what makes Iranian cinema so unique are the ingenious ways in which filmmakers have learned to sidestep the draconian censorship laws that, for example, forbid male and female characters from touching one another on screen. Such restrictions have forced Iranian directors to stretch their aesthetic powers in clever and creative ways, allowing them to develop a distinct and highly symbolic cinematic language that is instantly and universally recognizable as Iranian. Perhaps the most notorious aspect of this distinctly Iranian cinematic style is the use of visual poetry and metaphors to express views and emotions that would otherwise land the filmmaker in jail. Indeed, the use of metaphor has become so prevalent in Iranian cinema that plot is merely an afterthought, a fact that can sometimes confound Western audiences (and critics) who are used to the plot-driven, fast-paced action of an American movie. A middle-aged man drives through the outskirts of Tehran looking for someone to bury his body later that night after he commits suicide in Abbas Kiarostami’s Palme d'Or-winning masterpiece, Taste of Cherry. A poor laborer at an ostrich farm loses an ostrich and spends the rest of the film searching for it in Song of Sparrow from Majid Majidi, the Oscar-nominated director of Children of Heaven. Two mentally unstable sisters live locked up in their impoverished parents’ tiny home, where their interior lives clash with the world outside in The Apple, the directorial debut by Mohsen Makhmalbaf’s daughter, Samira Makhmalbaf. Based on a true story, The Apple features the actual sisters and their real parents, who “act” in the movie opposite professional actors. The dialogue of the actors is scripted; the dialogue of the sisters and their parents is unwritten and spontaneous. Samira Makhmalbaf’s achievement in The Apple is indicative of larger trends in contemporary Iranian cinema: The boundary between fiction and reality is often blurred, and the wall between the camera and the audience completely removed. So, for instance, Kiarostami’s Taste of Cherry ends with the film crew bursting into the scene to help the actor playing the main character out of his grave. Everyone shares a smoke as the credits role. Samira’s success also points to the increasing role in Iranian cinema of female filmmakers, many of whom are grappling with the thorny issues of women’s rights. It is not that this subject has been ignored by male directors. Jafar Panahi's two recent films— The Circle, a film about the lives of poor women in Iran that won the Golden Lion at Venice in 2000, and Offside, about a group of young female soccer fans who sneak into a match—have both been lauded for their searing criticism of the treatment of women in Iran. But it has been women themselves who have most forcefully challenged Iran’s censors by exploring themes of gender relations and social inequality. Indeed, some of Iran’s best filmmakers are now women: Rakhshan Bani-Etemad, the country’s most famous and prolific female director ( The Blue-Veiled, Mainline, Our Times); Tahmineh Milani, who directed The Hidden Half (a film that landed her in prison in 2001); Manijeh Hekmat, director of Women’s Prison and, most recently, Three Women; Pouran Derakhshandeh; Parisa Bakhtavar; the list goes on and on. Through the quality their work and the passion of their artistic achievements, women filmmakers like Neshat and Abdollahyan have placed themselves at the forefront of the revolutionary changes rocking Iranian society. Of course, women have some way to go—both in Iran’s film industry and in Iranian society—before they will finally be considered equal to men. At the end of Abdollahyan’s documentary Kick in Iran, a journalist asks Sara Khoshjamal’s indefatigable coach, Maryam Azamehr, if sports and the success of female athletes can have a lasting impact on the role of women in Iranian society. Azamehr scrunches her nose and looks up to the rafters. She thinks for a long moment. 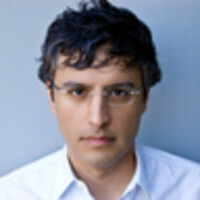 Reza Aslan, a contributor to The Daily Beast, is assistant professor of creative writing at the University of California, Riverside and senior fellow at the Orfalea Center on Global and International Studies at UC Santa Barbara. He is the author of the bestsellerNo god but God and How to Win a Cosmic War.